Why do training and learning awards matter? Indeed, research has shown that corporate award winners experience a more than 37% growth in sales. Furthermore, they have the price of their stock 44% higher than those of their peers. Therefore, with competition in the global economy on the rise, some businesses have discovered strategic value in training and learning awards. First, training and learning awards increase your credibility among prospective employees. Indeed, having the reputation as the employer that offers the best in training and learning attract the best talent, which in turn boost your business growth. Also, training and learning awards help in gaining sales advantages since the company enjoys increased awareness through free visibility. Furthermore, validation by a third party is always welcome (Cialdini’s marketing principles of Social Proof and authority) in establishing yourself as a market leader. Furthermore, training and learning awards open your business to more opportunities for funding due to increased credibility. Also, training and learning awards help your business benchmark, have a focused strategy, innovate and be in line with trends. In particular, they help point out your strengths and weaknesses. These Awards recognise employers in the UK who have designed and implemented training and skills development programmes with impact. Chiefly, the awards are the initiative of the City and Guild, a vocational education organisation with over a century experience in skills development. Meanwhile, the deadline for the next submissions is 15th April 2017, and the awarding ceremony will take place on 1st October. These awards recognize companies, businesses and institutions that develop and implement the best e-learning, mobile learning, and blended learning solutions. The deadline for the next submission is 1st March 2017. The IELA Awards Committee will look at educational soundness and effectiveness, usability, and overall significance of each submission. It will announce the winners on 17th June. The entry fee is $99 for non-IELA members and $79 for members. These are awards recognizing companies, brands and businesses that have developed the most effective e-learning strategies. The awards are twenty-five in total and include anything from Best Use of Games and Simulation for Learning to Best Strategy for Corporate Learning University. The deadline for the next submission is 15th April 2017 and the committee in charge will announce winners between 25th and 27th January 2018. The entry fee range between $575 and $795, depending on the category you enter. These awards are the initiative of Learning and Performance Institute. In particular, they recognise companies and businesses that achieve high standards, innovation, best practice and excellence in Learning and Development. The deadline for the next submission in 30th September 2017 at the awards ceremony will happen at The Dorchester, Park Lane, London on 2nd February 2018. These are annual training and learning awards that give you an opportunity to get public recognition as an excellent employer. Furthermore, once you successfully participate in this program, special publications of the Guardian and Sunday Telegraph showcase you. What’s more, these two have a combined readership of 1.2 million people. The awards recognise companies that have prioritized gender equality and demonstrate the commitment to nurture and maintain diversity in their teams. Meanwhile, the Workplace Gender Awards campaign by Business in the community is the only organisation that represents employers who want to change the workplace by ensuring that women are part of it. In fact, its objectives are to advocate for transparency, get rid of segregation in the workplace and change workplace cultures. Each entry attracts a fee of £ 1100, which includes VAT. These awards identify individuals and organisations that have contributed to the advancement of recruitment. It is free to enter the awards, and this is the organiser’s strategy to see the smallest and newest players in the industry participate alongside established organisations. The deadline for the next submissions is 31st March 2017, and the organizers will announce the winners on 23rd June. This award recognizes UK companies that offer the best employee experience. The submission deadline for 2016 is 16th December. After a panel of independent and respectable business authorities goes through the submissions, winners get the awards in March next year. The entry fee is £299.00 plus VAT, which you can pay by debit or credit card. Unlike other awards, the participants of The Peer Awards for People & Performance Excellence choose the winners from amongst themselves. Any professional within the UK is free to join as both a competitor and a judge. The deadline for 2016 is 31st December. The committee in charge will award the winners on 17th March. The entry fee is £250. These are awards targeting best performing payroll and benefits professionals. The awards are the initiative of The Pay & Benefit, which is an industry magazine for payroll and benefits professionals. The next submission deadline is 10th January 2017 while the awarding will take place on 7th March at the Victoria Park Plaza Hotel, London. This is the initiative of the British Safety Council that seeks to award organizations that are committed to creating a safe and healthy environment in which their employees work including through training of staff. The next submission deadline is 6th February 2016, and the council will announce the winners on 5th May. The entry fee is £275.00, excluding VAT, which is a price for member organizations. These are awards that the organizers have designed to encourage HR managers to observe diversity in their teams. The next submission is 19th February 2017 and winners will receive their awards on 12th May. The organisers of these awards welcome third party nomination of companies and businesses. These are awards that recognise businesses that are innovative and effective with their internal communication systems. The deadline for the next submission is 20th February 2017 and winners will receive their awards on 23rd March. After registering, the organizers will send you an invoice for the fee, which is £699 for the registration and a cost of an award attendance pass of £130. These are awards targeted at HR directors of UK businesses with 250 to 3000 employees. The winners are those that have formulated most efficient employee rewarding system. The deadline for the next submission is February 24th, 2017, and the announcement of winners will be on 13th July. This is the initiative of the HR Magazine that recognises organisations and individuals that are pushing boundaries in people management. Be ready to pay entry fees ranging from £195 and £385, depending on category and sector. The deadline for the next submission is 6th March 2017, and the winners will receive their awards on the 27th June at the London Hilton on Park Lane. These awards go to individuals and companies that have shown exemplary skills and innovation in managing people. The deadline for the next submission is 21st April 2017, and the event to award winners will take place on 27th September that year. These awards recognise the achievements of companies and businesses that have designed and implemented service training and management programs. The entry fees for each category range from £119 to £259 including VAT. The deadline for the next submission is 18th May 2017, and the winners will receive the awards on 14th July. These are awards targeted at HR managers who have implemented the most motivating strategies in their payroll systems. The deadline for the next submission is 8th July 2017, and awarding ceremony will take place on 3rd November. These are awards that recognize companies and businesses that put effort into engaging their employees in their processes. Entry fees are £100 before July 26, 2016. After that, a standard entry will cost you £150, and late registrations will cost £250. The deadline for the next submission is 7th October 2017, and the awarding ceremony will take place on 26th January 2018. There is nothing that makes a company attractive to valuable talent than be listed by a reputable publication as the best company to work for. Sunday time accepts submissions for the next list with the deadline being 14th October 2017, and the unveiling of the winners will happen on 24th and 25th February 2018. These awards were formally known as E-Learning Awards. They celebrate the technological innovations in the area of learning. The 2016 event took place at the Park Plaza Westminster Bridge Hotel in London with over 800 guests flying in from around the globe. The next awarding ceremony will happen on 29th November 2017 with the submission deadline being in July. These are awards that recognise the best performers in different areas in the food and grocery industry. Under the people category, there are learning awards that are set aside for individuals and businesses that have done well in employee wellbeing, learning, and development. The next deadline for submission will be in May, and the awarding ceremony will take place November 2017. The Training Journal (TJ) Awards promotes excellence, best practice, and innovation in Learning and Development. The first event for these awards took place in 2006 and is now one of the premier Training and L&D events in the UK. 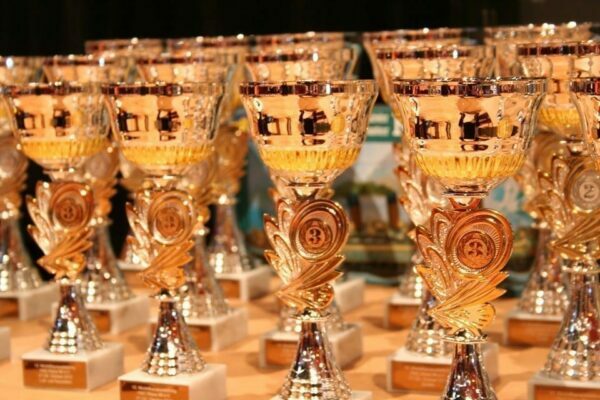 These are learning awards that recognise success in employee talent development. Organisers select companies from around the globe if they can show that they are building talent enterprise-wide and strategically driving a talent development culture to deliver results. These are learning awards meant to recognise UK employers who create training and skills development systems that are outstanding and have led to commercial benefits. City and Guilds, one of UK leading vocational skill development companies, is the primary sponsor of these awards. The registration for 2017 will open on 3rd January. If you would like your award added to this list, please Contact Us. We have the 'stickiest learning' method for your learners.